The Formatt Hitech 100mm Firecrest Filter Holder Kit is designed to allow for the convenient use of up to two, separately-available 100mm-wide, 2mm-thick filters along with an included circular polarizer. This kit comes fully assembled and features a holder which has its sides encased within a cover that helps to eliminate stray light, which could have unwanted effects on exposure, from coming in between any installed filters, as well as the filter holder and the lens behind it. The included aluminum-alloy filter holder is pre-installed with two pairs of plastic filter slots, a configuration that accommodates two rectangular filters. These slots are attached to the filter holder by a total of four screws, which also serve to apply pressure on any filters placed between the slots. Those screws can be loosened or tightened using the included Allen wrench to vary the level of grip upon the inserted filters, which can complement the use of graduated filters whose effect can be adjusted to better suit changing lighting conditions or creative demands by sliding them up or down within a filter slot. The filter holder cover is constructed from a matte black, scratch-resistant plastic that can be pulled in half to allow access to the filter holder. Compatible 100 x 100mm filters can fit entirely within the cover when they are installed on the holder. To permit the use of rectangular graduated filters that are 100mm-wide, but may be longer than 100mm, the ends of each half of the filter holder cover features two caps that can be substituted for two included slotted caps. Those slotted caps allow rectangular graduated filters to be used with minimal stray light even as they extend beyond the dimensions of the cover while it is assembled. A built-in gasket placed along the front of the filter holder further ensures that stray light does not come between an installed rectangular filter and a connected lens, regardless of which filter holder cover end caps are in place. Use of the filter holder can be easily accomplished by first screwing the included 82mm filter holder adapter ring onto a lens with 82mm front filter threads. Step-up rings are included to allow the adapter ring to be used with lenses that have 67mm, 72mm, or 77mm front filter threads; while additional step-up rings are separately available for lenses with 46mm, 52mm, 58mm, or 62mm front filter threads. After being fitted onto the adapter ring, the filter holder's pull-and-release locking lever helps to provide a reliable, yet adjustable connection that allows the holder to be rotated 360°, further benefiting the use of graduated neutral density and other filters that are enhanced by varied positioning. The 82mm adapter ring also accommodates the included Formatt Hitech 82mm Firecrest UltraSlim Circular Polarizer Filter for 100mm Firecrest Filter Holder Kit. When combined with the adapter ring and installed onto a lens with 82mm front filter threads, or adapted to lenses with other front filter thread diameters, the polarizer filter can be rotated to adjust its effect. The combination of the circular polarizer and the adapter ring, plus an optional step-up ring, can also be used with the filter holder with or without its cover installed. In such instances, an external dial on the filter holder allows for the independent rotation of the circular polarizer. Alternatively, separately-available filter holder adapter rings accommodate the circular polarizer as well. They provide the ability to mount the filter holder onto a lens with 72mm or 77mm front filter threads without the need for the 82mm adapter ring and an additional step-up ring. When the filter holder is used on a wide-angle lens with 72mm or 77mm front filter threads, those adapter rings can help prevent vignetting. 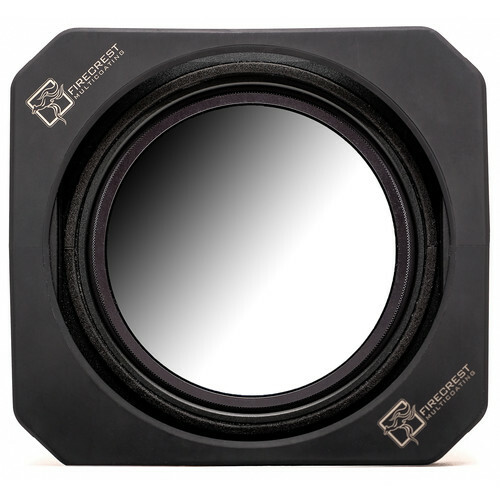 Box Dimensions (LxWxH) 6.6 x 6.1 x 2.2"
100mm Firecrest Filter Holder Kit is rated 3.6 out of 5 by 12. Rated 3 out of 5 by Michael from Better than the original I have the original, the one that has all the bolts that stick out everywhere and is a pain to deal with. This one is better. It's enclosed, no fastners stick out. But, it takes more work to use it. You have to take off at least one of the outside covers, unless you use the open slot cover, figure out how to hold the cover while dropping in your filter, put the cover back in place and unless you attached the holder to the lens first, now attach the holder to the lens. I suppose the addition steps make up for the lack of sharp protruding bolts, thus the 3 stars. At least it's easier to drop in a camera bag without worrying about scratching something. Rated 2 out of 5 by Jonathan G. from With fixes it could be a winner, but for now... First, the pros- the firecrest polarizer included is great and removing it is a lot easier than I thought it would be, from the videos I saw, and the system for reducing light leakage on long exsposure works nicely. Now the cons- On my Canon 17-40 f4 L, I got vignetting below 20mm even without the outer light seals, not a major deal for some I guess. The main problem I found was the slide button that holds the holder to the ring, it is a very basic design involving a single screw that holds the slider, the screw comes out and doesn't hold firm until the slider is completely unmoveable, that meant it either was too tight and very difficult to move (but secure on the lens ring) or loose so the holder can easily fall off, as when the screw is a bit looser, moving the slider makes it even looser, which gives more than enough play for the filter ring to pop out . My last problem with it is the polarizer rotating system, its very basic design meant It worked ok but at certain angle it lost friction and wouldn't turn the filter, again more of an annoyance than deal breaker. I'm not sure if I had a faulty one and I may have tried getting a replacement if it didn't vignette so badly on my go to landscape lense but as the vignetting was bad and it didn't feel secure on the lens, all I could imagine was $300+ of filters falling to the floor, I returned it. It's a shame because I've been looking for something like this for quite some time now. Rated 5 out of 5 by Anonymous from Great For Stills and Motion Photography. The new FHT 100mm filter holder is very easy to use for both stills and motion photography. I have used this system with the FHT ND's and Grads for time-lapse and long exposure still photos. I also use it for video. The system is durable, lightweight and easy to use/change filters. I have also found that it is a great solution for gimbals. I don't have to re-balance as much with screw on filters. The new Firecrest Polarizer is also super thin and great. Thanks FHT for a killer solution! B&H shipped fast and friendly as expected. All around great experience. Rated 4 out of 5 by Anonymous from Great holder, not too great of a case for it. The holder is fantastic. Everything from the look and feel to sturdiness. When installing the filter you need to make sure you align it with the holder's foam gasket and despite the scary looking 'gap' it's light tight with no leakage at all. There is no need to install gaskets on filters themselves. The pouch it comes with is not of the most fortunate design. As another user mentioned the flap does not cover the whole length and unless you are careful when positioning the extra side seals, you may find they will fall out of it. I just keep them in my backpack pocket instead. The inside dividers are rather soft and flappy and don't really offer sufficient protection for the polarizer on it's own. Again, I end up keeping it in dedicated storage. Hopefully the company will address the sub par packaging of all their products soon. Still, the holder is well worth the money. Rated 5 out of 5 by Anonymous from Spend the Money I must admit, I tried using a less costly Chinese filter holder first. Though the Chinese unit worked, the light leaks that resulted made the initial test images unusable. I then invested in the Firecrest holder. The light leaks disappeared. Now I have purchased two holders, instead of just one. I'd suggest you be less penny-wise-&-pound-foolish than I and just get one holder, the Firecrest. Rated 2 out of 5 by MichaelL207443077 from Not what I was hoping for Does not seem to be well made. Tiny screw heads to adjust tension and will strip out easily. Gasket leaves smudges in the middle of the filter putting it in and taking it out. Rated 2 out of 5 by Anonymous from Could be a great holder but falls short I wish I could like this more. Please see attached picture. There is gap between the holder and filter. This allows light leak which this holder should try better to prevent. There is too much play with the filter and holder. Better tolerances would improve this greatly. I know there is a gasket there to prevent this, but when you use a 100x150 filter The slotted caps only allow you to use it in the outer slot position, which does not mate snugly against the gasket. The slotted caps would be better if the open position is closest to the gasket. I have not received the 77mm adapter ring. I ordered it in Dec. 2016 and it is on back order. I had to use the step down ring. The rotating housing is nice, but there seems to be no way to lock it down to one position. The holder can be easily bumped and the filter position moved. I do like that it can rotate to optimize the light and filter. The case to hold the holder and parts is not well designed. There are gaps in the flap which allows thing to fall out and get lost. The extra set of end caps could very easily fall out. It would do well to be completely sealed when closed or an inner pouch that zips. It would do well with belt loops to allow quick access to the holder. Rated 4 out of 5 by Jack from Pricey But Worth the Investment The holder holds the filter really well with no light leakage. There are no instructions that come with it so you have to go to their (Formatt Hitech) website to watch the very well-made video. Once you watch it it's very easy to remember. Hence the 4 stars - no packaged instructions. is there a matte box you recommend for this product? Has anyone managed to capture any images when using with a Lee Super Stopper and a ND Grad filter at the same time without having the image ruined by light leaks? It works fine with the Super Stopper on its own, fully enclosed, but with an ND grad also, it ruins the image! Is there an option to attach the holder without the circular polarizer? Im am planning on buying a squat natural light filter for astrophotography, but I don't want any more light loss from the polarizer. I agree with the others who have responded. The option is there for the taking. Will this cause vignetting on a 17-35mm lens shot on a full frame camera? Online expert Colby Brown says vignetting goes away at 17mm with a 16-35. Anyone else notice that the product shot uses a Lee filter? Yes I see it now, good catch. BTW, I have this system and it works with all of my 100mm filters; Hitech, Lee and Singh-Ray. Are there slots I can buy that would let this accomodate 4mm filters? Does the company make an adapter that you can use on the Nikon 14-24mm or the Tamron 15-30mm super wide-angle lenses? Can the Firecrest 100mm system be configured for more than two slots for add'l filters, i.e. 2ND grads and a regular ND? I think so, but not with the materials supplied in the box. You would need to get longer screws and an additional plastic slot holder for each side.Plus, you will not be able to slide the light trap covers on the holder after doing that, so it somewhat defeats the purpose of the holder. It probably is not useful to do this.